When I mention to people that I regularly fake tan I normally hear some comments along the line of "Why don't you just go out in the sun and get a natural tan?" or "But doesn't it make you really orange like the people in TOWIE?" When you have naturally pale skin like me, getting a real tan just never happens, instead I just get freckles or burnt. While this can be annoying I don't hate my naturally pale skin. In fact I think that pale skin can look beautiful. 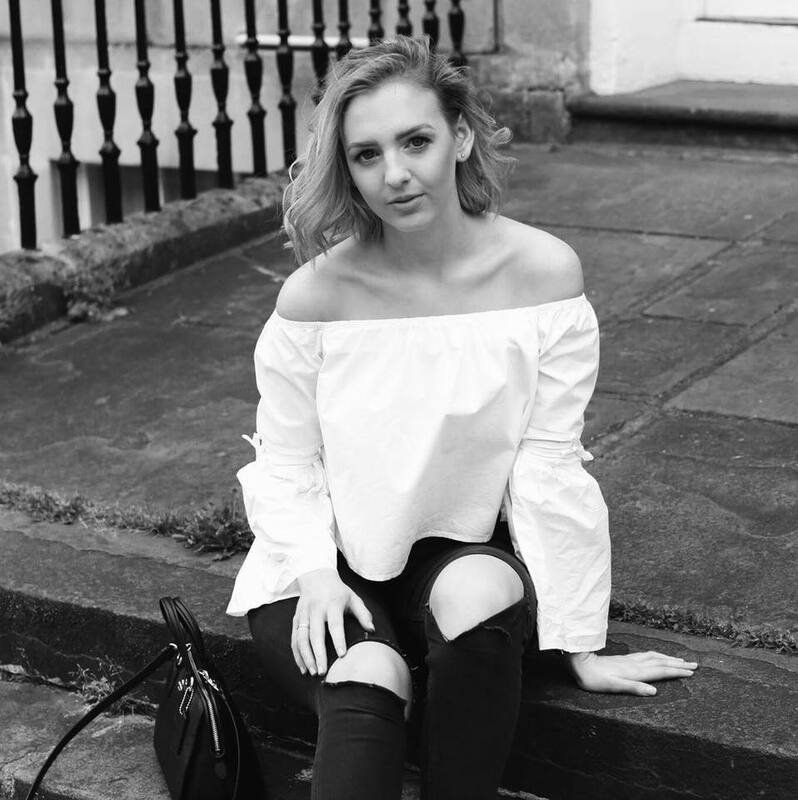 But I just think I look a little bit ill and washed out when I'm pale, and I find myself saying "this outfit will look so much better when I'm tanned". In general, I just feel more myself and more confident with a bit of fake tan on. So to maintain a glow I will typically tan every 5-7 days, letting my fake tan gradually fade but topping up it up sooner if I have an event to go to. Tanning this often I would say I have got my routine down to a T, so I thought that I would share it with you today. Now I try not to over complicate my routine, as tanning on its own can be enough of a chore without hundreds of other steps. So there are only a few products I use over a few key steps. Depending on how much time I have, I start off by having either a shower or a bath. Personally I prefer having a bath as I find it not only relaxing but also easier to shave, exfoliate and moisturise. Even if I don't have any old tan left of my skin I will always start off by exfoliating my skin using a pair of exfoliating gloves. 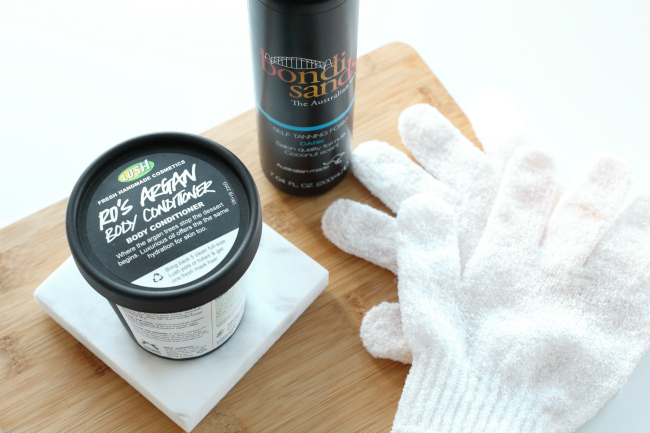 I have tried lots of different exfoliating products and while many are great at making my skin feel smooth, nothing gets rid of my old patchy tan like giving my skin a good scrub with my £1 Primark exfoliating gloves. The next step in my routine is to shave, now of course you can skip this step if you don't shave or use a different hair removal method instead, but not only do I find shaving the easiest hair removal method but it's also great for getting off any last stubborn patches of tan. Now that my skin is all smooth and even I like to add moisture back into my skin using Ro's Argan Body Conditioner from Lush. While I know this is one of Lush's more expensive products at £16.50, it has honestly revolutionised my tanning routine. Basically you use it as you would a hair conditioner but instead on your body, by massaging it into wet skin and then simply rinsing it off. It leaves my skin feeling just as moisturised, if not more than a normal body lotion but without that awkward sticky period where you have to wait around for it to sink in before you can get on with your day. 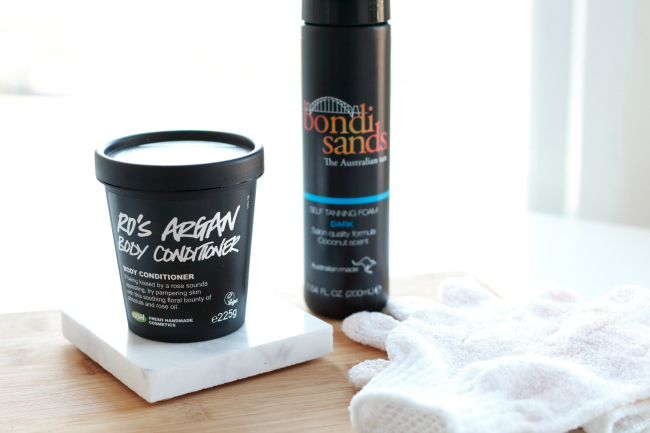 As Ro's Argan Body Conditioner doesn't leave any sort of tacky residue on your skin it makes it perfect to use on the day that you plan to fake tan because your fake tan isn't going to cling to any patches. Instead your skin will feel soft and smooth and your fake tan will just glide on like a dream. As for what fake tan I actually use, my favourite brand at the moment has to be Bondi Sands. Bondi Sands is a mid range tanning brand priced around the £10-£15 mark but I regularly find it on offer for even cheaper. It is easily available in Boots and Superdrug and they have a good range of products from in various shades. The tan I always use is their Self Tanning Foam in Dark (though it now comes in ultra dark which I am really excited to try) as I find it easy to apply, it doesn't go streaky and fades evenly. The only issue I have with it is that it stains before you wash it off and takes a while to develop but this is typical with most fake tans. Usually I sleep with it on and wear either a onesie or change my bed to black sheets to counteract these minor issues. The rest of my routine is pretty self explanatory, I apply the tan all over my body using a tanning mitt, go to sleep and then quickly wash it off in the shower in the morning and then moisturise using a regular body lotion once I'm out of the shower, before repeating the whole process again in about a weeks time. As for tips one thing I suggest is to always brush your teeth and go to the toilet before you put on the tan and then go straight to bed, otherwise you risk water splashing on you and ruining your tan or staining the white toilet seat, though if you want more I've written a whole post about it. Do you have any holy grail products or tips that make your tanning routine a lot easier?